We are developing a labor saving system for automation needs related to medical and biotechnology. It is a device which automated the process of dispensing and mixing each of acid-fermented liquid medium. We respond to customer’s request, adjustment of various liquid media such as aerobic bacteria / blood culture / yeast bacteria. Sampling work using swabs, such as DNA appraisal and pathogenic bacteria / microorganism identification, is diverse. 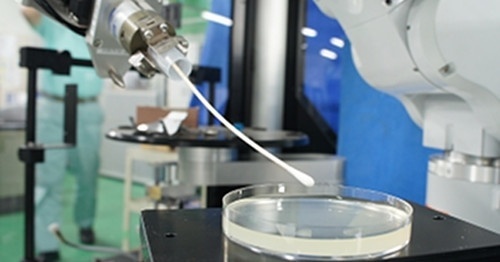 We will automate collection, addition and attachment work from a delicate foundation such as an agar medium, which could only be carried out by human feeling.